This is the second attempt at making fishcakes for little one. The first recipe I tried used tomato ketchup to replace the egg as a binding agent. Neither little one or her daddy and I were that impressed. Unfortunately I still have a tub of 10 little fishcakes of that version in the freezer, so I will have to do something creative with them at a later date so that they don’t go to waste! I think the tomato taste was a little overpowering and made the mixture a little too wet so it didn’t hold its shape well when cooking. This recipe doesn’t have anything in particular to act as an egg replacement to bind the fishcakes. The ratio of potato to the other ingredients means that it forms a more substantial mixture. I also find chilling the mixture before cooking helps a lot. One of the things I love about this recipe is that it is cooked in the oven. You could fry the fishcakes, however I find with little one being more active cooking things in the oven is generally safer than frying on top of the hob. It is also a healthier way of cooking, as it uses less oil. Another thing I love about this recipe is that is so versatile. You could substitute the tinned tuna for a tin of salmon, or even piece of fresh cooked fish. Using crushed crackers instead of breadcrumbs would add another great texture. 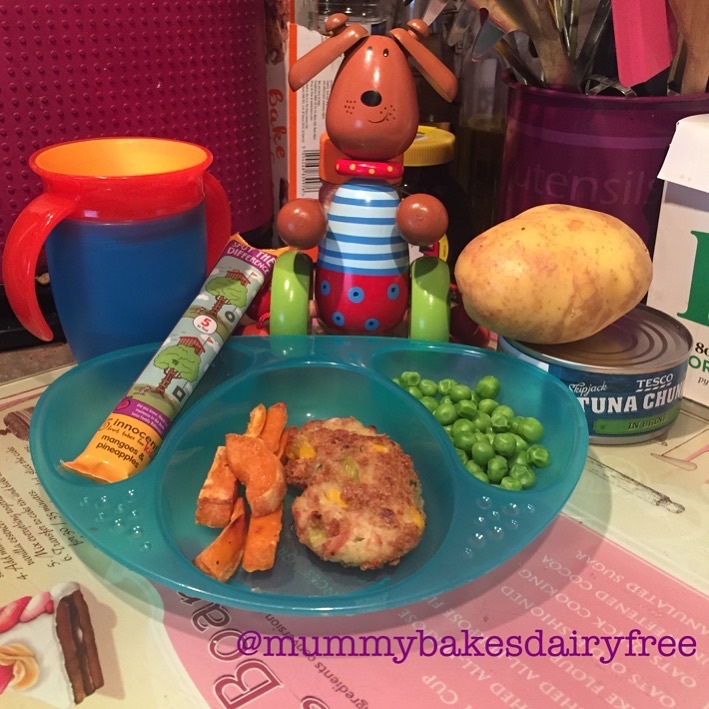 Tuna and sweetcorn fishcakes served with sweet potato chips, peas and an Innocent fruit tube. I served the fishcakes with sweet potato cut into chip shapes which were lightly coated with paprika and roasted in the oven, and peas. 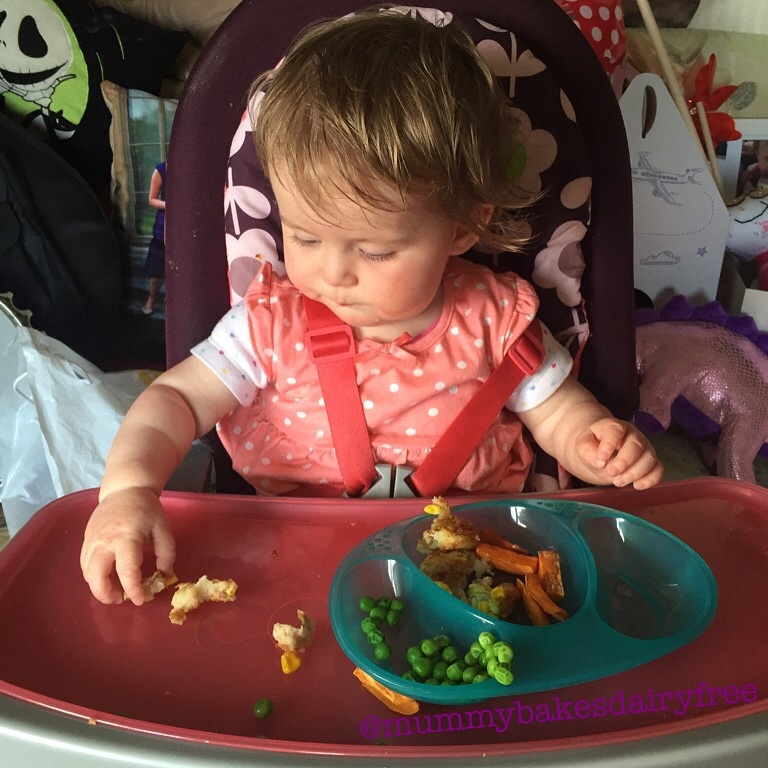 Little one really enjoyed every element of the dish and the peas are great for developing her hand eye coordination and fine motor skills. As well as practicing her fine motor skills, little one has also been coming on leaps and bounds with her gross motor skills. She has moved on from walking with her walker to walking holding our hands. I am constantly amazed at how quickly she has gone from just starting to crawl to assisted walking. I’m so glad that we didn’t push her before she was ready as she is so much more confident doing things at her pace. 1. Preheat the oven to 220 C, Gas Mark 7. 2. In a large pan of boiling water cook the potatoes for the mash until they are soft, yet still holding their shape, about 20-30 minutes. Once cooked, drain thoroughly and leave to cool. 3. Whilst the potatoes are cooking, tear up the bread into chunks and place in a food processor. Whiz up the chunks of bread until small breadcrumbs are formed. It helps if the bread is dry or slightly stale. Pour the breadcrumbs onto a plate for later on. 4. In a large bowl mash the cooled potatoes with the dairy free spread and dairy free milk until smooth and lump free. 5. Add the tuna, sweetcorn, spring onions and parsley to the mashed potatoes and stir until well and evenly combined. 6. Next start to form the fishcakes. I take a golf ball sized amount and roll it in my hands to form a ball. Slightly squish the ball and dredge through the breadcrumbs until lightly covered. I find if you slightly dampen the fishcakes with cold water before covering it helps the breadcrumbs to stick as we are not using an egg wash.
7. Pour the oil onto a lined baking tray and pop the fishcakes on top, turning so both sides are covered. 8. Once all the mixture is used up place in the oven for 30 – 40 minutes until golden brown and crispy, turning halfway through cooking. Allow the fishcakes to cool slightly before serving as they will be piping hot in the centre. I chilled the fishcakes in the fridge to firm up overnight before cooking as it helped them to keep their shape. Chilling for at least 30 minutes really is worth it. I also made all my little one’s portions first and then seasoned the mixture with salt and pepper before making two larger fishcakes for my husband and myself. To freeze the fishcakes: place in layers between greaseproof paper in a freezer proof and airtight container, before cooking them in the oven. You can then cook them from frozen when you need them just adjust the cooking time. 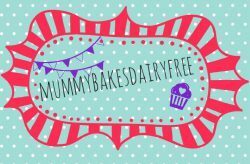 Dairy, egg and nut free. It could also be gluten and soya free depending on the breadcrumbs you use.